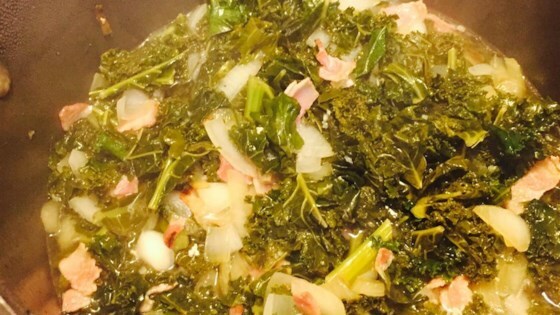 "Southern-style greens like my mama use to make." Combine onions, ham hocks, and garlic in a stockpot; add chicken broth. Cook mixture over medium heat until meat is falling off the bone, about 2 hours. Stir collard greens, vinegar, sugar, salt, and pepper into the broth mixture; cook until greens have reached desired tenderness, about 2 more hours. Turkey necks can be substituted for the ham hocks. Cook for 45 minutes instead of 2 hours. Bon and raised in the South I must admit this is one hell of a recipe. Very very good...I followed it exactly as written and I am pleased with the outcome. I don't know how I've lived without these my entire 45 years! I'll make this recipe for the next 45 years! Made this for a Sunday family dinner. SO good!